a field station in a parking spot across from the center for architecture. 1 – the parking space is defined spatially using a visual language similar to the new practices exhibition (i.e. black paint on the asphalt, white/reflective tarp) as focus for activity that extends to the immediate surroundings. 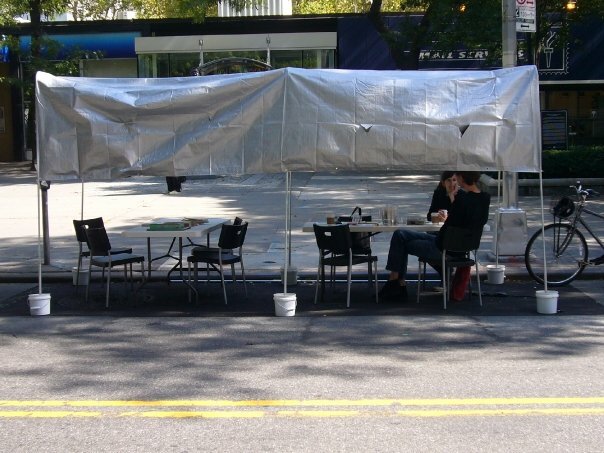 2 – the temporary park(ing) space serves as a gathering point for people and information related to the local architecture. a provisional field station for neighborhood research. as part of park(ing) day common room with guido hartray and the new practices new york committee, set up a field station to study the private use of public places and the public use of private spaces, focusing on three parks in the immediate vicinity of the center for architecture. the center for architecture park was made possible with kind support from transportation alternatives.